Visio 2010 comes in three editions: Premium, Pro and Standard. Each addition has different sets of content, and figuring out exactly what comes in each edition can be tricky. Microsoft has a nice explanation and break-down in this article: Visio Insights: Visio 2010 Editions. But if you need a precise list of what is included, that might not be detailed enough. Perhaps you have developed a custom set of shapes that depend on a particular add-on. Or maybe you are just curious as to just how many add-ons come with Visio. Either way, these lists will be of interest to you. If you’re not sure what an add-on is, this post might be a bit geeky. But you may still find it interesting to learn a little bit about Visio add-ons, anyway! Visio is a very customizable and extensible application. When a particular diagramming type requires special functionality, an add-on program can extend Visio to fill in the gaps where built-in features aren’t sufficient. Many features and functions in Visio started life as an add-in, then get rolled into the product in later editions. Other terms for add-ons are “add-ins” or “plug-ins”. No matter what you call them, they are helpers that extend Visio’s capabilities. If you buy 3rd party content and solutions for Visio, they may also ship with add-ons or add-ins that help you get the most out of Visio and the solutions’s graphical content. Visio 2010 Premium ships with 95 add-ons, plus 4 more if you install the Visio 2010 SDK. Visio Pro seems to include just about every add-in that Visio Premium includes. But Visio Standard contains a significantly smaller number of them. Many of the add-ons are started automatically with templates, called from shapes via the right-click context menu, or summoned via custom, solution-specific toolbar buttons and ribbons. 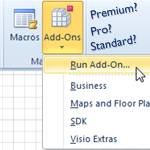 Check out the lists below to see all of the add-ons on offer inside of Visio. You might be surprised at what you find! Here’s an alphabetical list of the add-ons for all three editions of Visio 2010. Xs in the Premium, Pro, Standard columns indicated that the add-on is present for that particular edition of Visio 2010. Note there are four add-ons in the Pro column that are labeled as not-included. These are actually part of the Visio 2010 SDK. If you install the SDK, these add-ons will be available to you, no matter which edition of Visio you have. Here, the add-ons are arranged by whether they are included or not. So scroll to the bottom to see which add-ons aren’t included in a particular addition. Again, note the last four add-ons are actually part of the Visio 2010 SDK. If you install the SDK, these add-ons will be available to you, no matter which edition of Visio you have. Previous Post: « Download the New Visio 2010 SDK! I’m using UML Background Add-on in Visio 2007. I’d like to access the object hierarchy to read out documentation from classes, etc into reports using VBA. I can get to the Addon as an Addons item(i) but Addon.Application doesn’t seem to be defined. Is the UML Background Add-on hierarchy hidden or am I looking in the wrong place? BTW the UML implementation is very good and useful. I have a UML model in Visio 2007 that I want to move to Visio 2010. I do not know where the UML add-on for Visio 2007 came from but I suspect I need yours. I don’t just need the stencils and shapes but also the Model Explorer. I have the Standard version but it looks like I need the Pro version. How do I proceed?